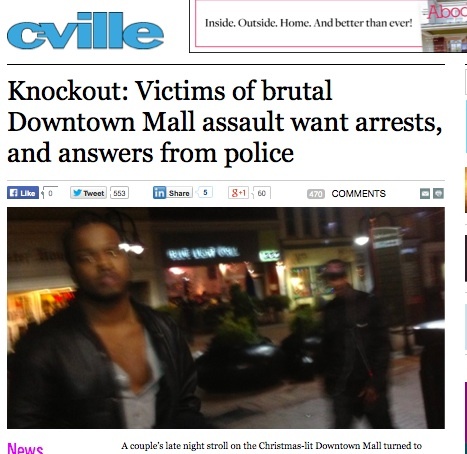 Indeed, a December 29 story in Cville Weekly titled “Knockout: Victims of brutal Downtown Mall assault want arrests, and answers from police” painted a horrifying picture of a white couple assaulted for nothing more than vicious sport by three black males, in what the alleged victims characterized as a “knock out” style attack. The story quickly went viral, prompting racially charged comments, blog posts, and discussions across the country, which forced the editor of the Cville Weekly to shut down the comment section beneath the story. A story that ran in The DTM, which featured an interview with Charlottesville Police Chief Tim Longo, questioned the alleged victims’ account of the incident, which Longo believed was “inaccurate.” Later, of course, the police investigation revealed that there was no unprovoked “knock out” style attack, and that the altercation began with a “verbal confrontation” between the two parties that escalated into a “physical confrontation.” In an interview in The DTM, the two men who were eventually charged in the assault painted a dramatically different story about what happened that night. While the primary organizers of the protest, Kiara Redd-Martin and Kishara Joy Griffin, who have founded a group called Operation Social Equality, have chosen to reserve their comments for a planned press release this Friday, Jeff Winder, a coordinator for Wayside Center for Popular Education, which was instrumental in organizing the first protest against Cville Weekly, has lent them his “behind the scenes” support and posted an announcement about the protest on the organization’s website. While the protest will take aim at the Cville‘s coverage of the incident, it will also take aim at the paper’s response to the public reaction of that coverage, and specifically to comments made by the paper’s editor, Giles Morris. The protest is scheduled for Friday, January 31 from 4:30pm to 6pm. Charlottesville, VA – Months after a popular protest forced an apology and a change in it’s editorial policy regarding hate speech, Cville Weekly finds itself under fire again – this time for racially-charged, sensationalist coverage and editorializing of a late night brawl on the downtown mall. On Friday, January 31st A diverse crowd will gather will march to the paper’s offices at 308 E. Main St. where they will protest from 4:30 until 6 pm. “We believe it was negligent journalism,” said Kiara Redd-Martin, a 24-year old graduate of Old Dominion University, and organizer of Operation S.E. “Reporting the story in this manner with so little investigation fueled people’s fears and inflamed racial tensions based on false premises.” The article repeatedly speculated that the incident was a “knock-out game” type of attack despite the fact that the validity of this racially-charged terminology has been called into question by law enforcement officials and more reputable news outlets nation-wide. Among the outcomes that protesters hope for is that Morris and the staff at Cville will undergo training that deepens their understanding of the nature of systemic racism and the responsibilities of journalists within that system. “The way this story was handled was offensive and the editor’s later comments on the caseare shameful as he chose to question the city’s moral obligation to preserve the black race, going as far as stating that the ‘educated, mobile, professional class’ of Charlottesville doesn’t have a race problem. Giles Morris – It’s time to check your attitude about racism. Until you do, we will be here, in the streets, in the media and in the offices of your paid advertisers calling you to accountability,” said Kiara Redd-Martin. Answers and arrests, plus Federal Charges from Holder. If the black community spent half as much time on their own problems as they do whining about anything and everything racism would decline at a much faster rate. There would not have been an assumption for the knockout game if blacks nationwide didn’t knockout white people and brag about it. Blacks spill blood at the hands of other blacks in this country every single day in this country yet we do not see black leaders speak up unless a white person says or does something that could be construed as offensive. Blacks should turn to their own so called leaders and demand the truth from them. They need to learn the lesson of the little boy who cried wolf. If blacks did not cause so much trouble than people would not have leaped to a wrong conclusion. Al Sharpton and Jesse Jackson make it pretty hard to follow lock step into every imagined slight.